American test pilot astronaut, 1965-1969. Status: Deceased; Active 1965-1969. Born: 1930-11-27. Died: 1970-09-04. Birth Place: Stamps, Arkansas. Born in Stamps, Arkansas; married with three children. Received BS in electrical engineering from the University of Michigan in 1959. Selected November 12, 1965 USAF MOL Group 1; departed on June 10, 1969 with the cancellation of the MOL-Program. He served as an instructor pilot at the Test Pilot School at Edwards Air Force Base. He was killed in the crash of his T-38 trainer near Palmdale, California, just over a year after the MOL cancellation. Died in Palmdale, California. Family: Astronaut. Country: USA. Flights: MOL 3. Agency: USAF. Bibliography: 6088. 1930 November 27 - . Birth of James Martin Taylor - . Nation: USA. Related Persons: Taylor. 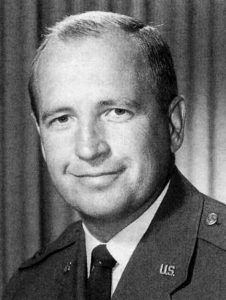 American test pilot astronaut, 1965-1969..
USAF MOL Astronaut Training Group 1 selected. - . Nation: USA. Related Persons: Adams, Finley, Lawyer, Macleay, Neubeck, Taylor. 1970 September 4 - . Death of James Martin Taylor at Palmdale, California. Crash of T-38 trainer. - . Nation: USA. Related Persons: Taylor. American test pilot astronaut, 1965-1969..
1972 Early - . LV Family: Titan. Launch Vehicle: Titan 3M. MOL 3 (cancelled) - . Crew: Crews, Taylor. Nation: USA. Related Persons: Crews, Taylor. Flight: MOL 3. Spacecraft: MOL. At the time of the cancellation of the MOL program in June 1969, the first manned mission was planned for early 1972. A crew of two would have spent thirty days in orbit operating sophisticated military reconnaisance equipment and other experiments..